I am going to get right to the point. I did not like The Kids Are All Right. This movie is the best example of why an ending is so important. I actually liked the majority of film. I basically enjoyed every aspect of the film besides the final act. I liked the characters, the situation, the comedy and the drama. But the final act left me with such a bad after test, I retroactively disliked the rest of the film. The Kids Are All Right is a Comedy-Drama, Dramedy, Black Comedy, or what ever you want to call it. Annette Bening and Julianne Moore star, as a lesbian couple, who have two children with the help of a anonymous sperm donor. The two children, Josh Hutcherson and Mia Wasikowska, want to finally meet their donor. They get in contact with him, Mark Ruffalo, and they meet with him. 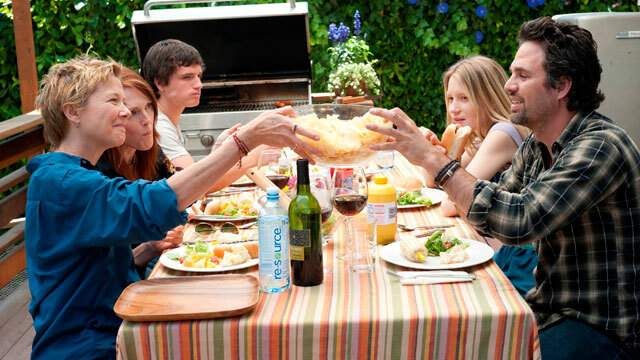 Soon after her meets the mothers, and then an affair stars bettween Mark Ruffalo and Julianne Moore’s characters. It’s all great, funny, and creative. Seeing this unique situation unfold was all done very well and appropriately. Where it falls apart was the final resolution for all the characters. As anyone could have guessed, in any film with an affair, the third person who is having no fun will eventually find out. Annette Bening eventually does, and everything breaks bad. Even the actual finding out and the anger was interesting and well done. The actually problem is the redemption of each of the characters. Then there was the entire boring scene of the daughter going to college. I think that the film would have been better if it would have been given one more act. Julianne Moore was forgiven too soon. They could have dragged it out slightly longer. Along with giving Mark Ruffalo’s character a chance to redeemed himself, or show him moving on with his life, and not just being blind sided and left alone in the cold dark night. The acting across the board was great. Julianne Moore was nominate for Best Actress. Her alcoholic lesbian performance was nomination worthy. Mark Ruffalo was nominated for Best Actor but Julianne Moore was completely shut out. Maybe I just need to watch it again in a different mood. But until then, because of the ending, I think the film was just average.